The Haunted Mansion has always been one of Disney’s most popular attractions. Yet no matter how often you may ride, you’ll probably notice details you missed during your previous visits. That’s because the Disney Imagineers intentionally filled the attraction with far more details than anyone could possibly discern, even after numerous excursions. They knew that this approach would entice guests to experience the Haunted Mansion again and again, appreciating previously unnoticed content each time. 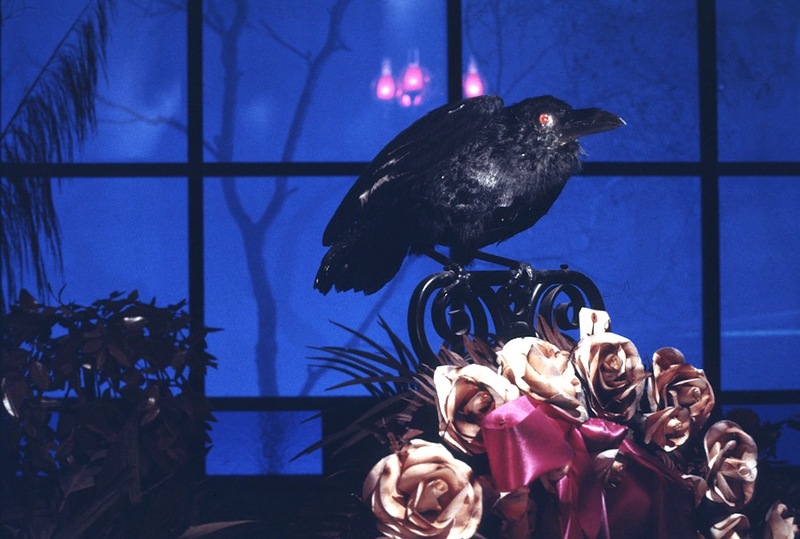 And now, with Halloween fast approaching, I’d like to share one of my favorite overlooked elements with you: the Mansion’s sinister raven. Because of the faint lighting levels inside the Mansion, the raven can be difficult to make out. But if you know where to look, you’ll spot the bird not just once, but FOUR separate times during the ride. Its first appearance occurs in the conservatory, perched atop a wreath next to the casket. The large black bird, with its glowing red eyes, is a suitably ominous presence. The Imagineers even recorded the raven squawking, “Nevermore!” in an audio tribute to Edgar Allan Poe’s famous poem, “The Raven.” The bird’s voice, provided by actress Eleanor Audley, (the voice of Cinderella’s stepmother and Maleficent), was never used in the ride. 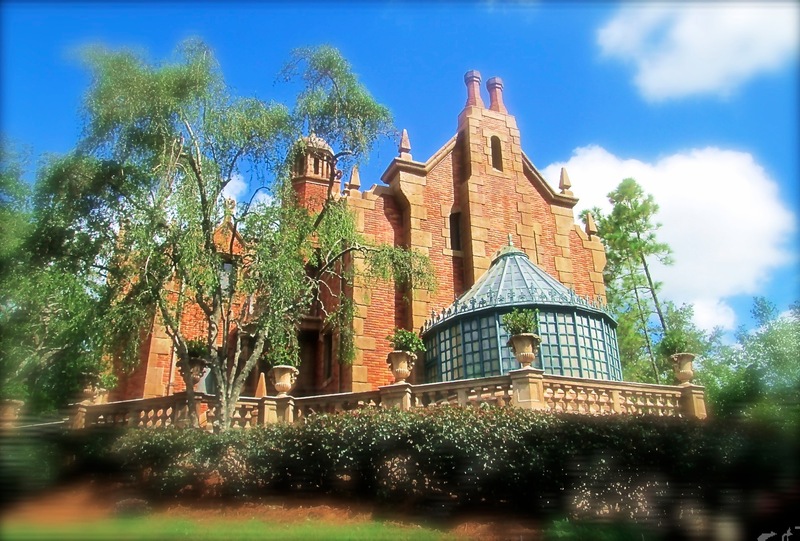 Yet Ms. Audley is still heard inside the mansion…as the voice of Madame Leota. Speaking of Madame Leota…the raven’s second appearance is in the séance scene, perched on the back of a chair behind Madame Leota’s table. You’ll see the bird a third time in the gnarled branches of a spooky old tree as your Doom Buggy begins its backwards descent into the cemetery scene. You’ll then encounter the raven one last time, perched atop the stone archway as you enter the crypt scene. 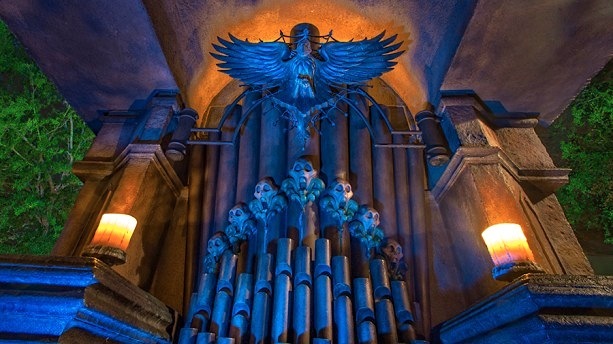 At the Magic Kingdom version of the attraction, you’ll also find a fifth raven: a stylized brass figure that adorns the stone pipe organ in the interactive area in front of the Mansion entrance. The front of the organ is inscribed with the name “Ravenscroft”—a not-too-subtle nod to voice actor Thurl Ravenscroft, the deep bass voice of the broken singing headstone in the cemetery scene. Obviously the inclusion of the raven in so many locations can’t be a coincidence. 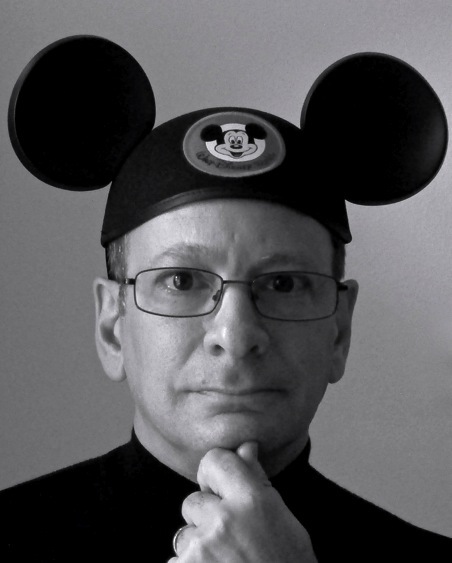 Which leaves you with this chilling challenge: to figure out why the Imagineers decided to give it such a prominent role. One explanation refers back to the Poe connection—the idea that the Imagineers found inspiration in Edgar Allan Poe’s famously unsettling poem. A second possibility suggests that the designers may have been influenced by Maleficent’s raven sidekick in Disney’s Sleeping Beauty, the production of which coincided with the early conceptual stages of the Haunted Mansion. Of course, ravens have always had a strong association with the spirit world, predating Poe’s 1845 poem. For example, they are prominent figures in both Norse mythology and in the creation myths of some of the indigenous peoples of America’s Pacific Northwest. So do you have a favorite Haunted Mansion detail that you only noticed after repeated rides? Feel free to share. But remember one thing: Beware of hitchhiking ghosts!